And you thought because it doesn't use peripherals Kinect would be spared a bunch of ridiculous third-party add-ons. Well, you were wrong. This is Atomic Accessories' "Game Boat". 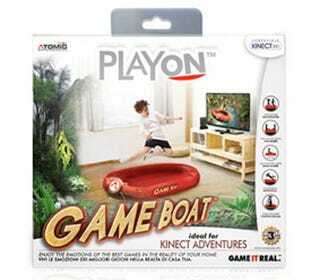 It's for Kinect Adventures, a game which includes a rafting game. So you blow up the inflatable boat, and...look, I'm not going to dignify this with an explanation. I'm just going to ask that if Atomic are mad enough to release this boat, they could at least go the whole hog and release the plastic jungle to go with it.